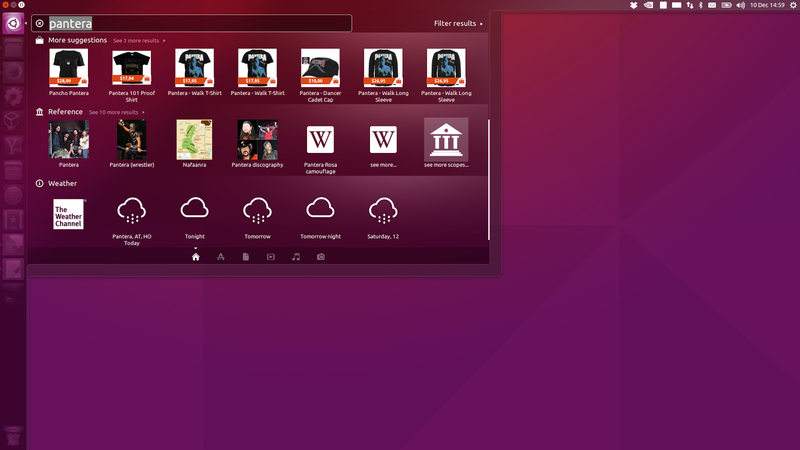 With Ubuntu 16.04 LTS, the Dash online search feature will be disabled by default. The online search feature won't be removed and users will be able to re-enable it via System Settings > Security & Privacy. This isn't the only change though. Even after enabling the Dash online search feature, the Amazon and Skimlinks results will remain off by default and there will be an extra option to enable them. Yet another change is the removal of the following scopes from the default installation (they will still be available for install from the repositories): Audacious, Clementine, GMusicBrowser, Guayadeque and Musique. And finally, the Music Store will also be removed starting with Ubuntu 16.04. "On Unity 8 the Scopes concept has evolved into something which gives the user finer control over what is searched and provides more targeted results. This functionality cannot be added into Unity 7 and so we’ve taken the decision to gracefully retire some aspects of the Unity 7 online search features". "By making these changes now we can better manage our development priorities, servers, network bandwidth etc throughout the LTS period". It's important to mention that the only change that will affect previous Ubuntu releases is the removal of the Music Store, while all the other changes will only affect new Ubuntu 16.04 LTS installations.